Baklan is a town and a district of Denizli Province, in Turkey's Aegean Region. The town is at a distance of about an hour from the city of Denizli, neighboring the town of Çivril, and it is situated on the road to Ankara. The subsequent Turkish town was alternatively called Dedeköy, a name which was its official appellation in some periods in the past. The name dede makes reference to the 13th century Seljuk warrior Alp Eren Hüsamettin Gazi Bey, whose tomb is within the town. 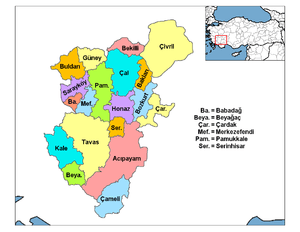 A township depending Çal district until 1990, it was made into a district at that time. A large part of the district is covered by the high plain that carries the same name as the town, Baklan Plain, and the town itself is situated on the slopes of the district's only mountain, Beşparmak, 1307 m. high. ↑ William Mitchell Ramsay (2004). The Cities and Bishoprics of Phyrgia: Being an Essay of the Local History of Phrygia from the Earliest Times to the Turkish Conquest, Volume I, Part I, pages 21-187-208-239 ISBN 978-1-4191-7283-0. Kessinger Publishing. Wikimedia Commons has media related to Baklan. This article is issued from Wikipedia - version of the 4/29/2013. The text is available under the Creative Commons Attribution/Share Alike but additional terms may apply for the media files.